It’s difficult to keep up with social media networks. Not only are new social media networking sites popping up in the marketplace. But it feels like the current sites are always being updated and how well something works to connect with people in your church or community is ever-changing. What works today may not have existed that many years ago (Facebook, Instagram, etc.) and it may not be around tomorrow. Take Myspace for example. At one time, Myspace was all of the rage. It was the largest social networking site from 2005 to 2008. In 2006, it was the most visited website in the United States—surpassing even Google. But after the introduction of new social networking sites and changes in user behavior—vamoose, Myspace vanished from relevancy. As of the writing of this post, Myspace now ranks as the 1,940 most visited website in the U.S.
One change in the way people in the U.S. chat with one another you need to be aware of is messaging apps—in particular, Facebook Messenger. In April 2017, Facebook reported that Messenger had 1.2 billion monthly active users. That’s a lot of people. If you combine the usage of the top four messaging apps (Messenger, WhatsApp, WeChat, and Viber), their usage surpasses the top four social media sites (Facebook, Instagram, Twitter, and Google+). Talking about the changes in the way people in your church and community use social media or messaging apps isn’t reserved for the classroom alone. Identifying these changes as they’re taking place will give you a HUGE opportunity to share the gospel of Jesus Christ better. Click here to see why thousands of churches trust Tithe.ly with their online giving and mobile giving solutions. One enormous opportunity you need to be aware of is Facebook Messenger Bots. Should you use Facebook Messenger Bots? A Facebook Messenger Bot is a program you can use to automate conversations and tasks in Facebook Messenger. From answering questions about the time your worship service starts to providing info about your church, you can set up a bot in Messenger to provide basic information or direct people to a resource on your church’s website. Since Facebook launched chatbots in 2016, many of their users have grown accustomed to interacting with these bots to get the info they need. Keeping in mind the increased usage of messaging apps, there’s growing precedence for your church to consider using Facebook Messenger Bots to connect with people online, which leads us to the next point. There’s a good chance you’re staff is spread thin like peanut butter. And to talk about adding another responsibility to your plate can feel overwhelming. But there are several good reasons you should consider adding Messenger bots to your social media strategy. Is your church staff spread thin like peanut butter? Does the thought of adding another task feel overwhelming? I can totally emphasize with this. After serving on the staff of two local churches, I know first hand that your time is valuable and limited. Creating Facebook Messenger Bots will save you time and help your church engage more people online. After you create the messages and sequences you need, you’ll be able to save a ton of time. The main thing you’ll need to do is monitor how well things are going to see if you need to make any adjustments. Like it or not, many people expect your church to be available 24/7. God is not confined to a 9 to 5 work schedule. He’s at work in the lives of your church and community 24/7. There will be times when someone is interested in learning more about your church, the gospel, or they just need a quick answer about an upcoming event. With Facebook Messenger Bots, you can connect with people in your community’s largest water cooler—Facebook—any time of the day or night. These bots don't replace the need for one-on-one communication or serve as a substitute for legit emergencies. But in many cases, they can at least help people out at the beginning or with essential information. What is more, many people now prefer to talk to a business via a messaging application instead of email. This trend in communication is also vital for your church to be aware of. If the people in your community have a growing preference to talk to a business through a messaging application, they will also have the same expectation with your church. According to MailChimp, the average email open rate for non-profit organizations is 24.98%. These aren’t bad numbers, and they’re slightly higher than the overall email open rate of 21%. But the open rate for Facebook Messenger bots is crazy high. Currently, many people are boasting an open rate of 80 to 90%. When compared to email open rates, that’s nearly four times higher! As I mentioned above, more and more people are adopting messaging apps to communicate. So it’s not surprising to see these initial numbers. I don’t foresee these open rates maintaining their current rate forever. Since Messenger bots are new to the game, it’s best to get involved now to engage your church and community. Need to see examples of how local churches are using Facebook Messenger Bots? If you'd like to clone this example for your church, Jake and his team have made it available for free. Click here and follow the instructions. 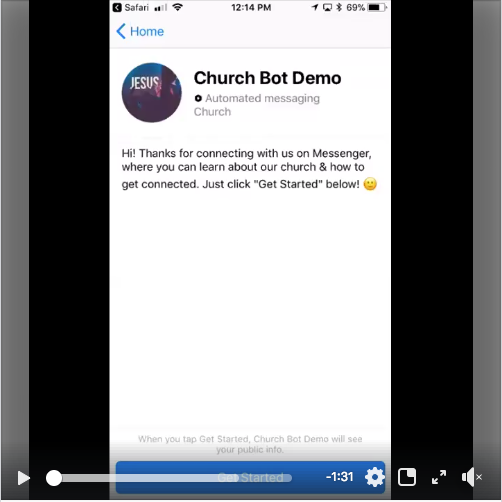 This one example and demo will give you an idea of how your church can use Facebook Messenger Bots. But let’s dig into the tips below to give you a better idea of what you can do. Before you dive headfirst into using Messenger bots, it’s a good idea to familiarize yourself with some dos and don’ts. Here’s a list of nine tips to keep in mind. It’s best to use a conversational tone with the messages you write. Facebook and Facebook Messenger is a place people go to be social, and they expect their interactions to be conversational. Whether you’re using Facebook Messenger Bots or you have a social media manager, don’t be afraid to use the voice of the people! The needs of these three different groups of people have differ from each other. To help answer their questions, you can add an initial question in your Facebook Messenger Bot to ask them if they’re a member, regular attendee, or new visitor. In other words, you’ll need to create a series of questions and answers for these three different people groups. We’re going to walk you through how. Lead people who connect with you on Messenger to your church. How can I contact your church? Place yourself in the shoes of someone who will potentially visit your church and think through the questions they’ll ask. Ask someone who messages your Facebook Page if they are a member or visitor. If they select “visitor,” then you can ask them a series of questions to make it easier for him or her or their family to visit your church. Did someone express interest in visiting your church? Schedule messages to follow up with him or her in a few days to see how their visit went. In this follow-up, you can also leave an option for them to choose to talk with someone at your church, request prayer, or something else. By now, you should know who you’re trying to reach with your Facebook Messenger Bots, the sequence you’ll use, and the questions you’ll answer. Now is the time to focus on writing the messages and scripts you need! I know you’re excited to get this done. But you’ll need to take your time to write, review, and finalize your messages. So take your time to get this right. Have you created your Messenger Bots? Did you test them to make sure everything is good to go? Now it’s time to lead people to your Messenger Bots. Now, as in the example above, when people visit your Facebook Page and click on “Send Message,” they’ll be promoted to “Get Started.” This is when they’ll be able to engage your Messenger bots. To get more people to use your bot, you can run click-to-Messenger ads. For this step, you don’t have to break the bank to pay for ads. You can target people in your community and set a limited daily budget to meet your needs. To get started, go to Ads Creation on Facebook. Next, you’ll need to choose Messages as the objective of your ads. After clicking “Continue,” you’ll have several options to choose from to optimize your ads. For a complete walkthrough on how to do this, check out this article on Facebook: Click-to-Messenger Ads. Facebook also provides you with buttons you can embed into your website. If you embed these buttons into your church’s site, when visitors click on them, then they’ll be led to start a conversation in Messenger. Messenger bots are promising and will help you and your church scale your digital marketing efforts and support. However, don’t rely solely on bots to replace person-to-person contact. For now, the bots you use are a great resource to help you start initial conversations and provide support. In time, as their abilities expand, you’ll have the opportunity to use them for more. But, in the end, it’s best to use them as a way of connecting with people to lead them to worship with you and your church. Don’t have the time to respond to everyone on Facebook? Would you like to increase your Facebook engagement? You can add a comment-to-Messenger bot to help you engage people on Facebook. When someone leaves a comment with a specific word or phrase, you can automate Messenger to deliver them a message or resource. To do this, you can post an update on Facebook that asks people to leave a comment with a specific word to receive whatever you’re offering. I haven’t seen churches use this feature yet (but this doesn’t mean some haven’t). In the screenshot above, I’ve highlighted “comment” to point out how this works. In this post, if you write “yes” in the comment section, then you’ll receive the free workbook offered. For your church, Chad Hugghins suggest offering a 7-day new member course, a 14-day prayer challenge, or a weekly sermon series supplement. As people connect with you on Messenger, you’ll slowly build your Messenger subscriber base. With this list of subscribers, you can send them a direct message similar to an email. You can build your Messenger bot. But you don’t have to spend time or money building something from scratch. There are several tools you can use to easily build bots without any coding required. For full disclosure, I haven’t had the opportunity to use these tools. However, they were recommended to me by a few friends. ManyChat is the one tool recommended to me most frequently. ManyChat doesn’t require coding, and they have a free option you can use, which should be more than enough to get started. Like ManyChat, Chatfuel offers a free option, and there’s no coding required to create your bot, messages, and sequences. There are several more tools available. So, if you’re interested in creating Facebook Messenger Bots, explore these options and spend time comparing them to others in the marketplace. What is more, there are groups available who can build a bot for you. Facebook Messenger Bots aren’t for every church. But they may be for your church. Do you have the time to build Facebook Messenger Bots? Do you have the time to promote this tactic? Do you have the bandwidth to monitor and optimize your Messenger bots? Do you have the financial resources to hire someone else to build and manage Messenger bots for you? Will adding this tactic spread your staff or volunteers too thin? Take the time to answer these questions with your staff or people in your church who are more familiar with bots to see if they’re a good fit for your church.